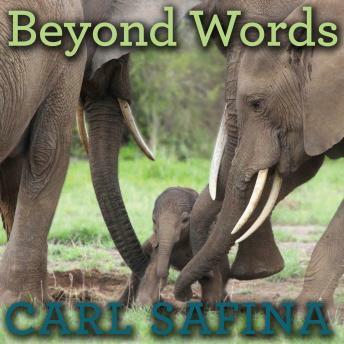 Weaving decades of field observations with exciting new discoveries about the brain, Carl Safina's landmark book offers an intimate view of animal behavior to challenge the fixed boundary between humans and nonhuman animals. In Beyond Words, listeners travel to Amboseli National Park in the threatened landscape of Kenya and witness struggling elephant families work out how to survive poaching and drought, then to Yellowstone National Park to observe wolves sort out the aftermath of one pack's personal tragedy, and finally plunge into the astonishingly peaceful society of killer whales living in the crystalline waters of the Pacific Northwest. Beyond Words brings forth powerful and illuminating insight into the unique personalities of animals through extraordinary stories of animal joy, grief, jealousy, anger, and love. The similarity between human and nonhuman consciousness, self-awareness, and empathy calls us to reevaluate how we interact with animals. Wise, passionate, and eye-opening at every turn, Beyond Words is ultimately a graceful examination of humanity's place in the world.